This year's challenge was to design a 20" square based on the theme of "Prospect Park" which is celebrating its 150th anniversary. The show opened Tuesday, Nov. 7 with a reception and discussion with the quilters and continues until Jan. 2, 2018. The Gerritsen Beach Library is located at 2808 Gerritsen Avenue (between Gotham Ave. and Bartlett Place). Click here for directions and opening hours. 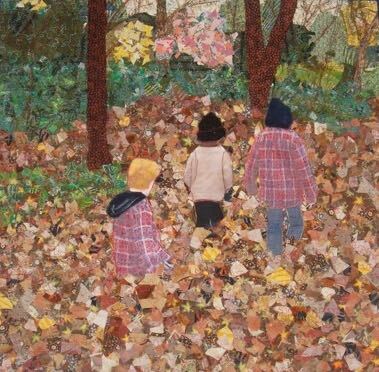 Quilts (Left to Right): An Autumn Walk in Prospect Park by Lyn S Hill, Celebrate! Prospect Park Turns 150 by Madeleine Appell, The Four Seasons in Prospect Park by Josette Piacenti, Celebrating in Prospect Park 2017 by Barb Christ.